Schnitzler syndrome is an autoinflammatory disease characterized by chronic, nonpruritic urticaria in association with recurrent fever, bone pain, arthralgia or arthritis, and a monoclonal gammopathy, most often of the immunoglobulin M (IgM) subtype. Approximately 10-15% of patients eventually develop a lymphoproliferative disorder, such as lymphoplasmacytic lymphoma, Waldenström macroglobulinemia, or IgM myeloma. See the image below. 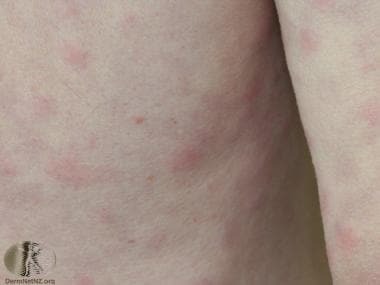 Rash of Schnitzler syndrome. Courtesy of DermNet New Zealand (http://www.dermnetnz.org/assets/Uploads/systemic/schnitzler.jpg). Radiologic evaluation shows evidence of hyperostosis in 35% of Schnitzler syndrome patients. Often, the areas of hyperostosis coincide with areas of symptomatic bone pain, such as the iliac bone, tibia, femur, and vertebral column. Nonsteroidal anti-inflammatory drugs (NSAIDs), corticosteroids, and immunosuppressive agents have been reported to provide variable relief from the symptoms of bone pain and arthralgias associated with Schnitzler syndrome. Systemic steroids may be somewhat effective at controlling the cutaneous eruption, but usually at doses that can cause significant, long-term adverse effects. Schnitzler syndrome was first described in a 1972 case report by French dermatologist Liliane Schnitzler,  who further described it 2 years later with several cases in 1974. Diagnostic criteria were established in 1999 by Lipsker et al. Most cases have been reported in Europe, although more and more are being described in North America and elsewhere. Schnitzler syndrome is an autoinflammatory disease for which the exact pathophysiology remains unclear. Dysfunction of several components of the innate immune system have been described, including the uncontrolled activation of interleukin 1-alpha (IL-1alpha). Increased levels of several members of the cytokine IL-1 family have been found, including IL-18. Others hypothesize that the deposition of the IgM paraprotein, leading to the formation of immune complexes and the activation of the complement cascade, is responsible for the cutaneous manifestations of Schnitzler syndrome. No risk factors have so far been identified. The pathogenesis of Schnitzler syndrome is still not well defined. Patients have shown deposition of IgM in the involved tissue. Using anti-idiotype antibodies, IgM monoclonal antibodies were demonstrated to react with epidermal antigens. In one case, monoclonal IgM was found to target 50-, 31-, and 17-kd proteins within epidermal extracts. These findings suggest that the IgM deposits may be involved in the pathogenesis, perhaps via the formation of immune complexes and activation of the complement system. Elevated levels of interleukin 6 (IL-6), granulocyte-macrophage colony-stimulating factor (GM-CSF), and granulocyte colony-stimulating factor (G-CSF) have been found in the serum of some patients. What role these cytokines play in the pathogenesis of Schnitzler syndrome is not clear. Only a few cases of Schnitzler syndrome have been reported from the United States. Schnitzler syndrome is rare, with approximately 200 cases reported in the literature. The original case was from France, with the greatest number of cases originating from the same country. The vast majority of cases come from Western Europe. The majority of Schnitzler syndrome cases are in white western Europeans. Males have a slight predominance with a ratio of 1.76:1. Patients with Schnitzler syndrome have ranged from age 13-71 years at the time of diagnosis. The average age of onset is approximately 52 years, [12, 1] although the average delay to diagnosis is more than 5 years. Most Schnitzler syndrome patients have a chronic benign course. No spontaneous complete remissions have been reported. Overall, the prognosis for Schnitzler syndrome is good. However, approximately 10-15% of patients develop a lymphoplasmacytic malignancy. Approximately 10-15% of patients eventually develop a lymphoproliferative disorder, including lymphoplasmacytic lymphoma, Waldenström macroglobulinemia, or IgM myeloma. Schnitzler's original patient died at age 88 years, with a diffuse lymphoplasmacytic infiltration of his liver and bone marrow. Thus, the initial workup of a Schnitzler syndrome patient should include an examination of the bone marrow, immunoelectrophoresis of serum, and a urinary protein level. A lymph node biopsy should be performed if the nodes are enlarged. Asli B, Bievenu B, Cardoliani F, et al. Chronic Urticaria and Monoclonal IgM gammopathy (Schnitzler Syndrome). Report of 11 cases treated with Pefloxacin. Arch Dermatol. 2007. 143:1046-1050. Eiling E, Moller M, Kreiselmaier I, Brasch J, Schwarz T. Schnitzler syndrome: treatment failure to rituximab but response to anakinra. J Am Acad Dermatol. 2007 Aug. 57(2):361-4. [Medline]. Krause, K, Tsianakas A, Wagner, N, et al. Effectiveness of canakinumab treatment in Schnitzler's syndrome: a multi-center randomized placebo controlled study. Pediatric Rheumatology. 2015. 13 (supplement 1):066. Schnitzler L, Schubert B, Boasson M. Urticaire chronique, lons osseuses, macroglobuline IgM: maladie de Waldenstrom. Bull Soc Franc Derm Syph. 1974. 81:363. Lipsker D, Veran Y, Grunenberger F, Cribier B, Heid E, Grosshans E. The Schnitzler Syndrome> Four new cases and a review of the literature. Medicine. Jan 2001. 80(1):37 - 44. [Medline]. Migliorini P, Italiani P, Pratesi F, Puxeddu I, Boraschi D. Cytokines and soluble receptors of the interleukin-1 family in Schnitzler syndrome. Scand J Rheumatol. 2019 Jan. 22:1-4. [Medline]. Olsen E, Forre O, Lea T, Langeland T. Unique antigenic determinants (idiotypes) used as markers in a patient with macroglobulinemia and urticaria. Similar idiotypes demonstrated in the skin and on peripheral blood lymphocytes. Acta Med Scand. 1980. 207(5):379-84. [Medline]. Saurat JH, Schifferli J, Steiger G, Dayer JM, Didierjean L. Anti-interleukin-1 alpha autoantibodies in humans: characterization, isotype distribution, and receptor-binding inhibition--higher frequency in Schnitzler's syndrome (urticaria and macroglobulinemia). J Allergy Clin Immunol. 1991 Aug. 88(2):244-56. [Medline]. Vandenhende MA, Bentaberry F, Morlat P, Bonnet F. Anakinra: An effective treatment in the Schnitzler syndrome. Joint Bone Spine. 2011 Dec. 78(6):636-7. [Medline]. Morita A, Sakakibara S, Yokota M, Tsuji T. A case of urticarial vasculitis associated with macroglobulinemia (Schnitzler's syndrome). J Dermatol. 1995 Jan. 22(1):32-5. [Medline]. A Sediva, H Hansikova, J Sladkova, M Rodinova, Z Hajkova, J Zeman, et al. PW03-008 – Mitochondrial disturbances in Schnitzler syndrome. Pediatr Rheumatol Online J. 2013. 11(Suppl 1):A234. [Medline]. de Koning HD, Bodar EJ, van der Meer JW, Simon A,. Schnitzler syndrome: beyond the case reports: review and follow-up of 94 patients with an emphasis on prognosis and treatment. Semin Arthritis Rheum. 2007 Dec. 37(3):137-48. [Medline]. Basile C, Rossi L, Casucci F, Teutonico A, Libutti P, Lisi P, et al. Kidney involvement in the Schnitzler syndrome, a rare disease. Clin Kidney J. 2017 Dec. 10(6):723-727. [Medline]. Simon A, Asli B, Braun-Falco M, De Koning H, Fermand JP, Grattan C, et al. Schnitzler's syndrome: diagnosis, treatment, and follow-up. Allergy. 2013. 68 (5):562-8. [Medline]. Simon A, van der Meer JWM, Drenth JPH. Familial auto-inflammatory syndromes. Harris ED, Budd RC, Firestein GS. Kelley's textbook of Rheumatology. 7th. Philadelphia: Saunders; 2004. Chapter 112 pp1773-88. Akimoto R, Yoshida M, Matsuda R, Miyasaka K, Itoh M. Schnitzler's syndrome with IgG kappa gammopathy. J Dermatol. 2002 Nov. 29(11):735-8. [Medline]. de Koning HD, Bodar EJ, Simon A, van der Hilst JC, Netea MG, van der Meer JW. Beneficial response to anakinra and thalidomide in Schnitzler's syndrome. Ann Rheum Dis. 2006 Apr. 65(4):542-4. [Medline]. Niederhauser BD, Dingli D, Kyle RA, Ringler MD. Imaging findings in 22 cases of Schnitzler syndrome: characteristic para-articular osteosclerosis, and the "hot knees" sign differential diagnosis. Skeletal Radiol. 2014 Jul. 43 (7):905-15. [Medline]. Néel A, Henry B, Barbarot S, Masseau A, Hamidou M, et al. Long-term effectiveness and safety of interleukin-1 receptor antagonist (anakinra) in Schnitzler's syndrome: a French multicenter study. Autoimmun Rev. 2014 Oct. 13 (10):1035-41. [Medline]. Worm M, Kolde G. Schnitzler's syndrome: successful treatment of two patients using thalidomide. Br J Dermatol. 2003 Mar. 148(3):601-2. [Medline]. Ramadan KM, Eswedi HA, El-Agnaf MR. Schnitzler syndrome: A case report of successful treatment using the anti-CD20 momoclonal antibody rituximab. Br J Dermatol. 2007. 156:1072-74. Krause K, Weller K, Stefaniak R, Wittkowski H, Altrichter S, Siebenhaar F, et al. Efficacy and safety of the interleukin-1 antagonist rilonacept in Schnitzler syndrome: an open-label study. Allergy. 2012 May 15. [Medline]. de Koning HD, Schalkwijk J, van der Ven-Jongekrijg J, Stoffels M, van der Meer JW, Simon A. Sustained efficacy of the monoclonal anti-interleukin-1 beta antibody canakinumab in a 9-month trial in Schnitzler's syndrome. Ann Rheum Dis. 2013 Oct. 72 (10):1634-8. [Medline]. Jani P, Vissing MB, Ahmed S, Sluzevich JC, Aulakh S, Alegria V, et al. Ibrutinib for the Management of Schnitzler Syndrome: A Novel Therapy for a Rare Condition. J Oncol Pract. 2018 Jun. 14(6):387-388. [Medline]. The authors and editors of Medscape Reference gratefully acknowledge the contributions of previous Chief Editor, William D. James, MD, to the development and writing of this article.